This post goes out to all you wonderful teachers with a student in your class who needs an FM system; to hardworking school-based service providers- SLPs, OTs, PTs and counselors! And of course to parents- doing the most important and difficult job of advocating for you child. The traditional classroom is not the optimal acoustic experience, to put it mildly. One speaker (ie. the teacher) stands at the front of the classroom while students in rows of desks listen. This creates an unbalanced advantage for those sitting in the front of the room for the majority of the school day. The classroom is also known to be an environment that has a lot of background noise, both from among the students in the classroom (talking, desks and chairs scraping etc.) and from outside the classroom (hallways and street/play yard.) To add to all this, classroom are generally more reverberant (think “echo-y”) since there are not enough materials to absorb the sounds such as curtains and carpeting, and there are a lot of hard surfaces for sounds to bounce off of, such as tables, desks, and boards. While a student may receive great benefit from a hearing aid or cochlear implant in less complex listening situations, an FM system is a great way for the student to have an easier time hearing and focusing in the classroom. The FM system consists of two components: the microphone and the receiver. The microphone picks up sounds and sends them via frequency modulated (FM) waves through the air to a receiving device, which are then presented to the child’s ears. It is similar to bluetooth technology, but uses a different frequency to transmit the sounds. The microphone is worn by the teacher, or whoever is speaking. It can also be placed on the table during a group project, or even connected to the computer speaker output so the audio output of a video will be routed directly in. 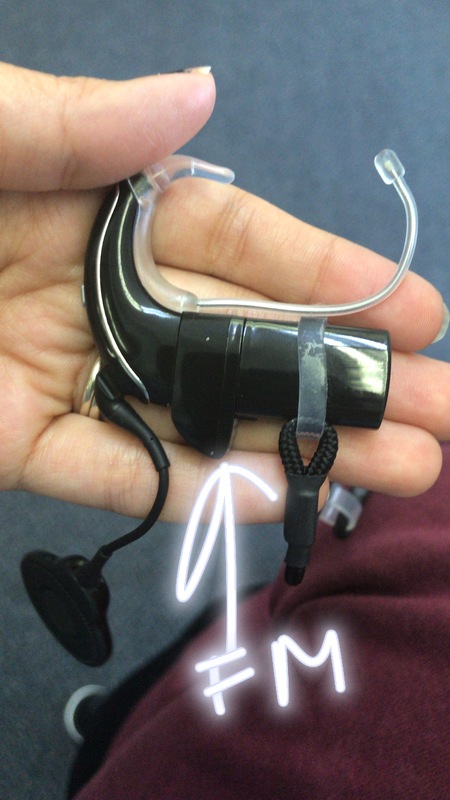 The receiver is the device that gets the signal sent to it and can be attached to the student’s hearing aid or cochlear implant, or be a stand alone ear-worn device. The purpose of the FM system is to reduce the background noise and improve the signal-to-noise ratio, the SNR. (The “signal” is the sounds the listener wants/needs to hear, while “noise” is the unwanted sounds. The SNR refers to the ratio between these, that is, how much louder is the signal than the noise.) Also, using an FM system nearly eliminates the reverberation since the sound waves are routed directly to the receiver. Use of an FM system is especially helpful for students with hearing loss, or auditory processing disorders, but can definitely also be beneficial for students who have difficulties with language, attention, and focus. Another configuration of a classroom FM system can be a soundfield receiver. With this setup, the sounds are sent to a speaker and thus the teacher’s voice can be heard by all the students in the class, not just directed to one child’s ears. This is ideal for large classrooms, classrooms where there are multiple students who need FM technology, especially if the students won’t tolerate an ear-level device. In addition, this can be an economic option for schools. There’s also the bonus benefit for the teacher who doesn’t have to raise their voice, a known chronic problem among teachers that leads to vocal nodules or polyps. Using an FM system daily in the classroom can be somewhat cumbersome and tedious, especially at first when becoming familiar with the technology. However, the benefits to the student’s experience in the classroom are great and cumulative. Take a bit of time to familiarize yourself with the specific model and pairing process. Don’t be afraid to ask questions and learn how to use the device in your specific context (speech therapy sessions, classroom, group projects and activities). Previous What is Hearing? What is Hearing Loss?